• The Governor's "Celebrate! Illinois 2007" Inaugural Ball Includes the World's Largest Catsup Bottle! The major social event held the evening of Governor Rod's second-term inauguration, showcased unique communities, traditions, and culture of Illinois. When Collinsville City Councilman Joy Springer attended the Governor's Inaugural Ball in Springfield, she had no idea a little bit of home would be there to greet her. "I walked into the Ball and there on the State of Illinois poster is the Catsup Bottle," Springer said. "How cool is that?" Get the complete story here! • The Illinois Bureau of Tourism included the Catsup Bottle in its Offbeat Illinois retro poster campaign back in July of 2006. Wally Spiers, our favorite columnist from the Belleville News-Democrat, admittedly a bit behind of the times, writes a great article about the poster. • We officially announce that the ninth annual World's Largest Catsup Bottle Summerfest will be held Sunday, July 8, 2007. • The Illinois Bureau of Tourism launched the "Seven Wonders of Illinois" promotion. Nominees are placed online and put into "March Madness"-style brackets for each of seven tourism regions. • Vote for the Catsup Bottle to win it all starting March 5! The tourism bureau will announce one winner for each region on April 30, along with themed travel packages and downloadable videos! 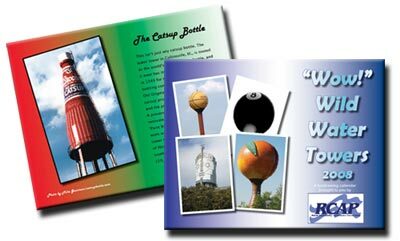 • The Catsup Bottle is being mentioned a lot in the press because of the great "Seven Wonders of Illinois" campaign. This time, it's courtesy of Mandy St. Amand of the St. Louis Post-Dispatch. It seems to be popping up on every TV station from Chicago to St. Louis as well. We love it! • The Chicago Tribune, the Chicago Sun-Times, the Southern Illinoisan, and the LaSalle News-Tribune all include a story about the "Seven Wonders" campaign! But for some reason, the Sun-Times doesn't mention the Catsup Bottle... and the News-Tribune says the Catsup Bottle would be the "silliest" example of a wonder. Hmmmm, we're going to pretend we didn't hear that. • We just never know what we'll get when we check our email. Here's a great letter we received this morning. It's amazing to hear these stories about how much the Catsup Bottle really means to people! Check it out! • A "Seven Wonders of Illinois" article by Chad Morelli of the Collinsville Herald appears in Wednesday's local paper with great photos and a couple of brief comments from Judy DeMoisy. The piece also runs on different days in many of the other Suburban Journals around the region. • The much-anticipated voting for the "Seven Wonders of Illinois" has begun! March Madness-type brackets have been set up to determine the winners! As we all like to say around these parts: Vote Early and Vote Often! Today we received a call from a wonderful lady by the name of Wendy Gray. She was in the middle of making her favorite spaghetti sauce and suddenly realized she was out of Brooks ketchup! She then emailed and shared her recipe and her great family stories. • The World's Largest Catsup Bottle has made it into the Final Four of the Southwest Region in the "Seven Wonders of Illinois" campaign from the Illinois Department of Tourism. Columnist Mandy St. Amand of the St. Louis Post-Dispatch, had a fantastic piece in the paper today. Check it out!. We stopped in at Bert's Chuckwagon for some BBQ today and owner Roger Conner shared at great story with us. He recently had a great conversation with a couple who was traveling from Memphis to the Quad Cities. They saw the little red dot on their map indicating the World's Largest Catsup Bottle and decided to check it out. They loved their visit to the Bottle and then saw Bert's and stopped in for lunch and had a fantastic time! It's the little things like this that keep us going, folks. • Today we learned the Catsup Bottle was squeeeezed out of the running for the "Seven Wonders of Illinois" campaign. Still, the voting continues, and we throw our full support behind Cahokia Mounds World Heritage Site! We received a call today from Scot England of WAND-TV Channel 17 in Decatur, Illinois. He and his crew will be visiting the Catsup Bottle bright and early on Thursday, May 3. We'll be doing live spots with him beginning at 6:00 am. Come on down and say "Hi!" and maybe get on TV throughout central Illinois! Just got off the phone from taping an interview with KMOX radio (AM 1120) in St. Louis. The station wanted a couple of sound bites as the Illinois Bureau of Tourism will release the names of the winners in the "Seven Wonders of Illinois" campaign on Monday, April 30. (The Catsup Bottle made it to the Final Four in the Southwestern region.) Listen for the piece to air sometime Monday morning! Scot England and the morning news crew from the NBC affiliate in Decatur, Illinois, WAND Channel 17, visited the Catsup Bottle doing their version of "Where in the world is Matt Lauer." We were set up and ready to go in the pre-dawn hour and did live spots with him beginning at 6:00 am. We even had a visit from the 2006 Little Sir Catsup, Dylan Phegley! After the live spots ended at 7:00 we taped a few extra pieces that were going to be put together for the 5:00 news. Take a look at the photos from that morning right here! A couple of months ago we were contacted by Paul J. Ritter, III. His great-great-grandfather started the P.J. Ritter Company, based in New Jersey. P.J. Ritter merged with the Suppiger/Brooks Company in 1959. Brooks Foods was a subsidiary of Ritter when the company was purchased in 1967 by Rochester, New York-based Curtice-Burns. Curtice-Burns eventually became Agrilink Foods and Agrilink became Birds Eye Foods, Inc. Today, Birds Eye Foods owns the brand name and continues to produce "Brooks Finer Foods". Mr. Ritter was kind enough to share with us quite a few historical company photos including personnel, equipment, operations, and various plants. We sincerely appreciate his effort and can't thank him enough!! We finally got the picture posted to our web site. Click here to enjoy a trip down Memory Lane with the fantastic Ritter Photo Collection. We were able to snap a few photos one afternoon while some of the projects were on display in the hallways at school. Click here to check 'em out! It is with a heavy heart that we must report the World's Largest Catsup Bottle Summerfest Birthday Party & Car Show Bash will not take place this year. The Catsup Bottle Fan Club, organizers of the Summerfest, were unable to agree to the terms of the contract forced upon them by the City of Collinsville. After 8 years of independent success, a new city administration attempted a hostile takeover and unfortunately the festival couldn't survive. It's a lurid tale of greed, money, power and politics that we'd all just soon forget. Today we got a nice email from Melissa Jones of the Community Resource Group requesting a Catsup Bottle photo to use in their fundraiser calendar. The CRG is a nonprofit organization that helps rural communities with projects concerning their H2O needs. Take a look at WaterTrust.org and click on the "Just for Fun" link to find a slew of wild water towers from across the country! A special thank you goes out to everyone who stopped by to say "hi" on July 8. Even though the Big Birthday Bash on Main Street was cancelled, we thought it would be a good idea to be at the Bottle to meet and greet folks who came by. It actually turned out to be a really fun time as we went ahead and had the 9th annual Catsup Bottle Summerfest right then and there! The C.I.A. "Cruzin' In Antiques" Classic Car Club held its annual Car Truck & Bike Show to benefit the World's Largest Catsup Bottle Fan Club during the World's Largest Ketchup Packet event held by Son Life Church in Collinsville. Virginia Steffen and her crew from the PBS station, WILL-TV, in Champaign-Urbana, Illinois, paid us a visit today. She is working on a documentary featuring the Catsup Bottle. It was a lot of fun even thought it was really, really HOT! Plus, it gave us the chance to see Rod Reinneck again! Rod and his team from Diversified Coatings in O'Fallon, Illinois, restored and repainted the Catsup Bottle back in 1995. No air date has been set, but Virginia tells us to expect it sometime in the spring. She'll let us know, and we'll let you know! The photo gallery is right here! The World's Largest Catsup Bottle Summerfest has been named a "Best of St. Louis 2007 Winner" by the Riverfront Times! You'll never believe which category we won "The Best Festival Gone Missing!" We received a call this morning from the Ellen Degeneres Show web site producers in New York City. They are working on the "Ellen Across America - Wish You Were Here" campaign, and needed some high-quality photos of the Catsup Bottle for use in a feature story. Of course we were more than happy to oblige! Everyone please log in to ellen.aol.com and let them know the Catsup Bottle is your favorite "XXL Attraction" and we may just entice them to get us featured on the show! As the end of the year approaches, we want everyone to have the chance to get their "Wow! Wild Water Towers" calendar! It's a fundraiser for the nonprofit Community Resource Group which helps rural communities with projects concerning their H2O needs.